William Owen Carver (1868–1954) was a denominational stalwart and longtime professor of Missions and Comparative Religion at the Southern Baptist Theological Seminary. For more than four decades he educated the denomination’s ministers and missionaries. Carver was considered one of the brightest minds in the growing denomination, a distinction evidenced by a seminary building, denominational library, and Baptist school of social work that continue to carry his name. He was a prolific writer, managing editor of the SBC academic journal Review & Expositor, and the first president of the Southern Baptist Historical Society. In addition to these contributions, Carver was a Southern Baptist ahead of his time, gently prodding Southern Baptists to see beyond the narrow confines of theological conservatism and to engage the modern world. In the process, Carver became embroiled in numerous denominational controversies, some of which still resonate in our world today. These stories are the subject of this book. 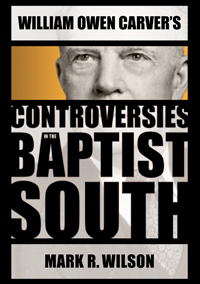 Carver’s controversies illustrate how freethinking Baptist leaders interacted with their more conservative constituency as they sought to equip the denomination for existence in a religiously diverse, scientifically oriented society.